Profile: When Skullgrin dons his synthoplasmic outer shell, he becomes a monster in more than just appearance alone! Where the robot Skullgrin is cold and logical in his approach to warfare, the Pretender Skullgrin is a brutal, uncontrollable engine of destruction who won't stop attacking until everything is destroyed (or someone manages to stop him). How and why is still a mystery, but the theory is that his outer shell has a personality of its own, and when Skullgrin is inside, he loses himself in it. The other Decepticons aren't complaining, though. It's well known that Skullgrin tends to get somewhat distracted when he's on a mission or even in the middle of a pitched battle. Earth fascinates him and he's eager to sample the planet's delights, even if it means neglecting his duty. He's also quite vain, liking attention. The Pretender Skullgrin is usually quite the opposite. He won't be stopped, won't be frightened off, and can't be bargained with. When the job's done, when all that remains of his foe is a few metal scraps, that's when he will stop. Because his intelligence is somewhat limited in Pretender mode, Skullgrin is always eager to lead the charge into battle - and he never, ever retreats. Needless to say, none of his fellow Decepticons ever try to dissuade him from this course of action. After all, as they say, there's gotta be someone dumb enough to do it! At times, the Pretender Skullgrin's behavior becomes quite erratic, even for him, possibly as a result of the two disparate personalities trying to interface on the same level. This could account for the uncharacteristic lack of hostility and extreme vanity he displayed when he briefly became a movie star. At times, there can be something of a communication problem. When he's in Pretender mode, Skullgrin often tends to communicate in a series of snorts and snarls. Abilities: In Pretender mode, Skullgrin wields a terrorizing slagmaker carbine - its heat beam capable of melting metal up to four inches thick - and a metal-rending vibro sword. The constantly changing energy field around the sword means it can both cut and scramble circuits at the same time. His outer shell is very strong, able to resist artillery hits, and it enhances his strength tenfold. 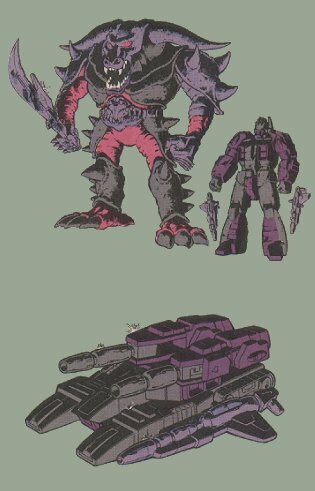 Out of his shell, Skullgrin transforms into a shrapnel-blasting assault tank. He can fire energy beams or shells that explode in midair, firing deadly shrapnel in all directions. As with all Pretenders, Skullgrin is able to mentally control his outer shell when he is not in it, literally splitting himself into two warriors. Weaknesses: Skullgrin has hardly any weak points when he's in his outer shell. His only real weaknesses stem from his lack of intelligence. Not only is it sometimes hard for him to make himself understood, but he sometimes gets so carried away in the heat of the battle that he's as much a danger to his fellow Decepticons as he is to his enemies.